"Octavia Harlow Moulton Graffte "
Black and white photograph of Octavia Graffte taken before her marriage. She came to Dennistown Plantation, Maine, to teach in 1890. 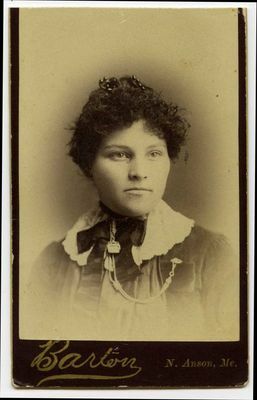 A note on the back of the photograph indicates that her nickname was "Tavie." The photography studio printed on the front of the photograph is Barton, N. Anson, Me.